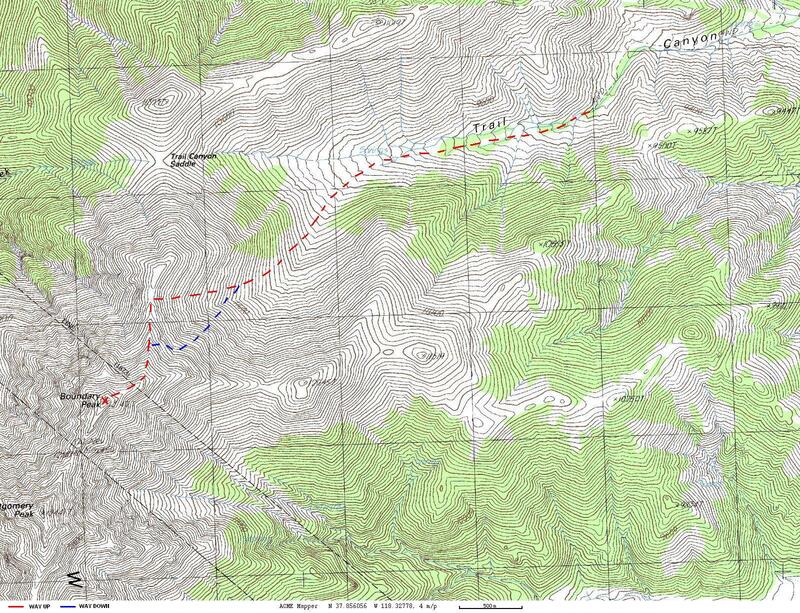 We arrived in the White Mountains area on June 21st 2005, right after visiting Mt. Whitney and Death Valley, recording both extremes on my altimeter in 24 hours. Most guidebooks mention Tonopah, NV as the nearest place for lodging but there's actually a tiny motel in Montgomery Pass, much closer to the mountain, and also much cheaper - we got a reasonable room for the whole family for $30. The motel was a bit hard to find as most people appeared to have abandoned the town. It was actually hidden behind a deserted casino, and there was another, also deserted motel across the highway, further confusing matters, so maybe this explains the low price. Next morning we left for the trail. A dirt road starts from the junction of state roads 264 and 773. There are a bunch of intersections but just following the forks that seemed to take us closer to the mountain intuitively worked out pretty well. The road does get a bit rough in the end though and I scratched the bottom of my Camry a few times but it was passable. The trail itself was really nice as long as it followed the stream but got pretty dusty after the springs and finally got lost in a maze of cow trails. I started bearing left, aiming for a little saddle about halfway between the peak and Trail Canyon Saddle. Once above the vegetation line I found the trail again and trodded up the slope. The grade wasn't too bad but it was 100% scree at that point, which slowed me down considerably. It got better once on the ridge but now the main obstacle turned out to be piles of huge boulders in a few places along the ridge. I didn't feel too adventurous and simply skirted around them, which was further complicated by deep half-melted snow, so I kept post holing every few steps and wishing I had taken my snowshoes with me. The start of the final summit ridge was the worst, I spent 15 minutes gaining less than hundred vertical feet at one point. The summit itself was nice, someone had built a small wall to protect people from wind behind which I could sit down and read the summit register. Apparently there had been exactly one party on the summit every day for the last week or so, and I was the only one there on that particular day. Going back was a lot easier (see splits table below) as the scree works both ways, making descent a lot faster than ascent. Also, I could use the last snow and covered significant distance glissading. All in all, the descent took only 1 hour and 45 minutes (compared to a 4 and a half hour ascent).